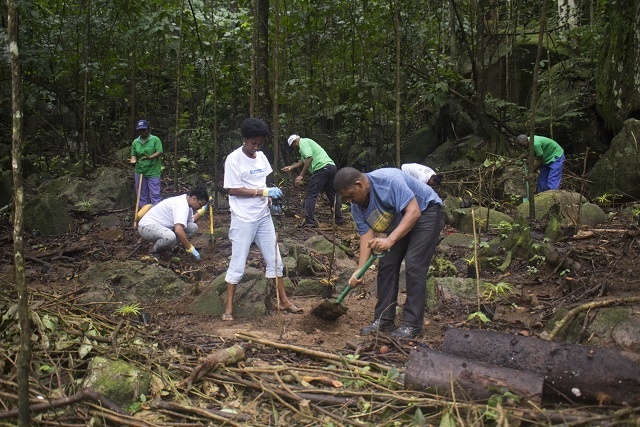 (Seychelles News Agency) - To mark the end of Commonwealth week, a tree planting activity was held in one of Seychelles’ national parks, contributing to the number of trees being planted in the country under the Queen’s Commonwealth Canopy (QCC) initiative. Staff from the Ministry of Environment, Energy and Climate Change and the Seychelles National Parks Authority (SNPA) in collaboration with the British High Commission dedicated their Friday morning last week to planting 400 endemic palms along the road of L’Exile, Sans Souci. The area forms part of the Morne Seychellois National Park located on Mahe, the largest island of Seychelles. The QCC initiative aims at bringing together the 53 member countries by creating a network of forest through conservation projects. The initiative is also committed at raising awareness about the value of indigenous forests within the member nations. “I know that there was an event in London at which her Majesty the Queen was briefed on this initiative. She was particularly impressed by the contribution Seychelles made. When you think about the population size, the number of trees planted meant that it was really quite a significant contribution,” said the British High Commissioner to Seychelles, Caron Rohsler. Seychelles, a-115 island archipelago in the western Indian Ocean, is one of 19 countries committed to the QCC initiative. The high commissioner added that this initiative gives all countries an equal voice in the world, regardless of the size. “You are contributing to a much bigger objective in the world, [as] you are making a difference whether it is contributing to a carbon sink, contributing to the beauty of your country or providing a home for nature,” said Rohsler. Flavien Joubert, the chief executive of SNPA, said that in the case of Seychelles, the trees being planted under the initiative is being used to reforest various areas on Mahe and other islands. “SNPA is continuously working on reforestation projects in the Morne Seychellois national park, where we are continuously adding different types of palms and other endemic plants to make sure that we add diversity in the national park,” said Joubert. 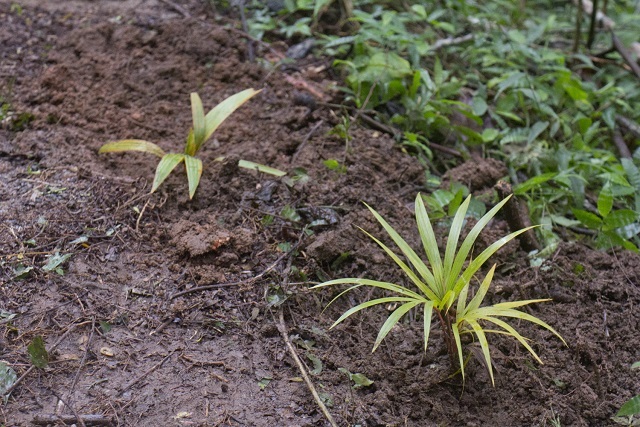 Two palm species -- Phoenicophorium borsigianum, locally known as ‘Lantannyen fey,’ and Nephrosperma vanhotteanum known as ‘Lantannyen milpat’ -- were planted on the site. “The palms give a lot of shade and can grow under low light conditions. By introducing new species in the woody forest we are encouraging animals and insects to make the forest their home,” said Joubert. He added that working on improving the biodiversity and quality of forest creates a condition that will slow down the rate of invasion by other plants as they a low amount of sunlight reaches the forest floor. 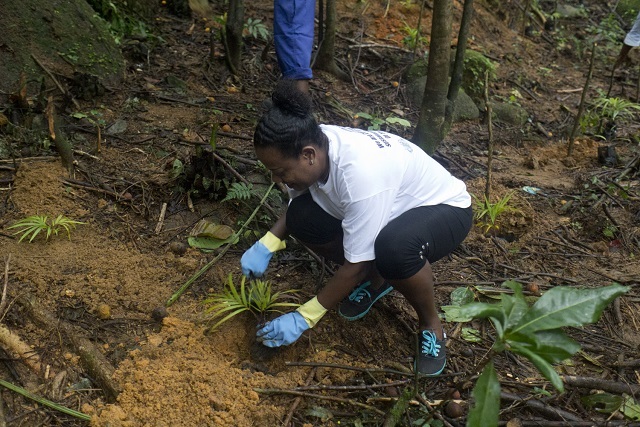 A similar planting activity was carried out last year at Mont Hauteur, a mountain on Praslin, the second-most populated island of Seychelles. The area has been repeatedly affected by forest fires.